In the town of New Temperance, souls are in short supply and Nina should be worrying about protecting hers. Yet she’s too busy trying to keep her sister Mellie safe. When Nina discovers that Mellie is keeping a secret that threatens their existence, she’ll do anything to protect her. Because in New Temperance, sins are prosecuted as crimes by the brutal church. To keep them both alive, Nina will need to trust Finn, a mysterious fugitive who has already saved her life once. Wanted by the church and hunted by dark forces, Nina knows she needs Finn and his group of rogue friends. But what do they need from her in return? 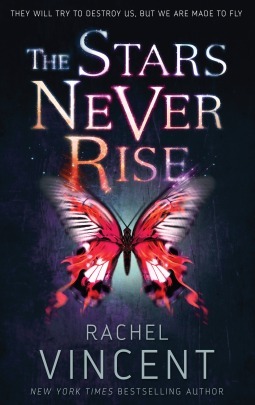 A blend of futuristic dystopia and urban fantasy, The Stars Never Rise follows in the famous footsteps of Downside Ghosts and Kate Daniels, at least genre-wise. In her new series, as of yet untitled, Vincent takes us to a world of demon possessions and fallen governments, where souls are a hot commodity and terrified people are ruled by the Church’s iron fist. Rachel Vincent’s previous work wasn’t all that interesting to me, mostly because of all the love triangles she so loved to introduce, but here she abandons cheap tropes in favor of excellent plot development and a romance that is creepy and complicated all on its own, without any help from a third party. We meet Nina as she struggles to keep her little sister clothed and fed, and we see right from the start that she is a heroine worth knowing, a resilient, strong young lady willing to do anything it takes to survive. Their mother is an addict who spends her days locked in her room, refusing to participate in life in general and spending most of the money Nina earns on drugs. Nina herself isn’t above stealing, lying, cheating and even using her body if it means her little sister will get food on her table. She is a heroine in the truest sense right from the start. While Nina may be ready to become a member of the Church just to protect Melanie, destiny has other plans for her. In a single day, she becomes aware of her powers, which instantly turns her into the Church’s enemy number one. But her powers bring her backup as well, a group of young people with those same abilities and same fugitive status. Although at times predictable, Vincent’s story is excellently paced and dark enough to satisfy even a more demanding reader. Most characters may be young adults, but the content is balancing a thin line between YA, NA and adult. I’m not a fan of shielding teens from the harsh realities of life and I admire Vincent for writing so honestly and openly, without barriers or concerns. Unlike Vincent’s previous works, this series utterly captivated me, making me wonder how I’ll survive until next year, or more precisely June 2016, when The Flame Never Dies is set for release. I cannot wait for this book to come out. It sounds like a very captivating plot. Nina seems like a protagonist I am going to like. I was curious about this one but I need to read so many books by her before this new series. So so late, i n any case it's nice to see that it's a good one! I love that there is no love triangle in this! That was the only thing that really bothered me about her Soul Screamers series. I need to get this one! Great review! I'm so glad to hear you enjoyed this one, Maja! I've never read a novel by Vincent and am curious to start so the fact that this worked out far better than her previous novels makes me excited. Wonderful review, dear, and I'm glad to hear this is triangle-free (phew!). Never read any of her books but this sounds like this could be worth a read! Great review! YAY! Now with you and Jenny both giving this one 4 stars and really enjoying this, I'm even more sure that I will love it! Oooo! This one looks very intriguing. Maybe I should hold off a little longer so it's closer to the second book's release. I haven’t heard about this book before, so thanks for bringing it to my attention. Sounds interesting. Wonderful review, Maja! I'm waiting for my copy - this sounds perfect for me! The characters and world sound like ones I would enjoy. You had me at: "The Stars Never Rise follows in the famous footsteps of Downside Ghosts and Kate Daniel-"
OOoh nice! I loooove Rachel Vincent and her books, so I feel like it's a safe bet that I'll loooove this one too! LOL! It does sound pretty different from reads I'm used to. Though I did read Stacia Kane's one series for awhile before quitting it. It sounds very intriguing though! Can't wait to read it! Great review! I didn't care for her Shifter series but I'm willing to give this one a chance since it impressed you so much.